Fifty activists from the Homesh First group celebrate a Tu B'Shvat seder in the community of Sa-Nur, destroyed in 2005. 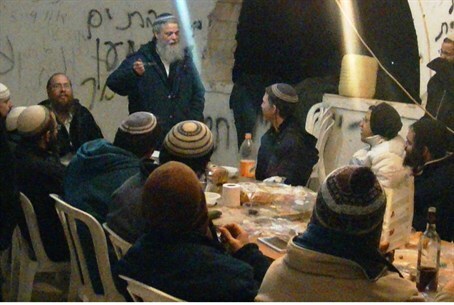 Fifty activists from the Homesh First group, both religious and secular, gathered on Tuesday night in the ruins of the community of Sa-Nur, where they held a Tu B'Shvat Seder together with students from the Homesh yeshiva. Both Homesh and Sa-Nur, located in the northern Shomron (Samaria), were both destroyed in 2005 during the Disengagement plan. Ever since, there have been attempts by residents to make Homesh their primary home despite frequent Border Police raids in the area. The Homesh First activist group aims to rebuild all the cities and towns demolished in 2005 – beginning with Homesh. The Tu B'Shvat Seder was attended by Rabbi Itamar Orbach, rabbi of the community of Hashmonaim near Modiin. Participants sat around a table laden with fruits of the land of Israel and reported of an uplifting atmosphere which included singing and dancing.